For Increased Business, Improved Social and Love life and Oratory skills, Protection against Dangers and Mishaps. Made from Pong Puttakun (Magic Powders made from Chalk Yantra Inscription) mixed with the Finest Grade Pong Mai Mongkol 108 (108 types of Rare Magical Herbal Powdered Woods and Pollens). the amulet has fragments of sacred magical substances sprinkled into the Muan Sarn of the rear face of the amulet. The finely hand painted designs on each amulet are beautifully and lovingly applied with individual attention. The front face features the Taep Nak Giaw (Naga Pair Entwined), in a Posture very Reminiscent and Representative of the Pitsamorn Deva (Butterfly King). The amulet has the riches mixture of Sacred Powders of the whole edition, and is the Masterpiece (Ongk Kroo) of this Line of Wai Kroo Amulets of 2555 BE. 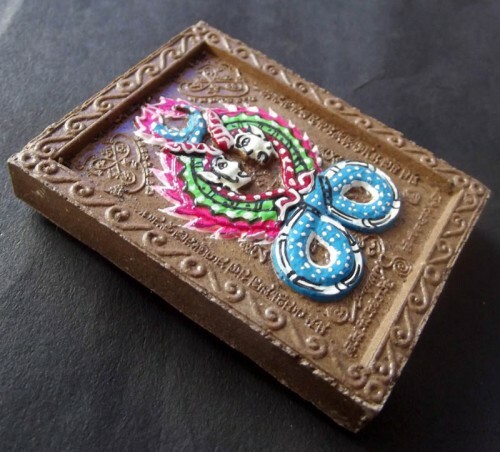 A Large amulet with Aromatic Emission, which is hand painted with Colorful Embelishments. 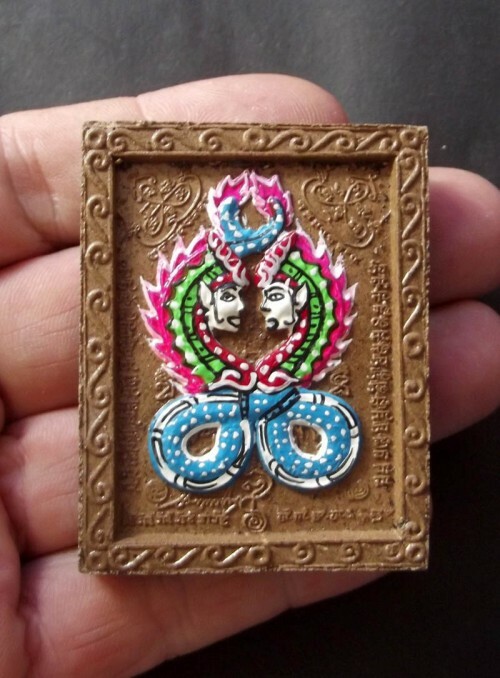 Each and every Amulet has slightly different individual color markings, making each Amulet a Unique piece of Miniature Buddhist Sacred Arts. The Entwined Naga Devas offer a very Powerful Metta Mahaniyom Effect (Induce Compassion and Preference and, Helpfulness and in the hearts of those who approach), along with Klaew Klaad (Evasion of Danger and Mishaps), Maha Amnaj (Power and Convincing Effect) and Pokasap (Wealth and Treasures) Magic. 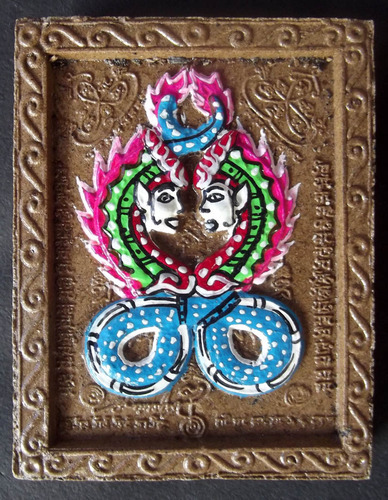 The Nak Giaw is thus a More Proactive Metta Mahaniyom type Thai Amulet than the Passively Effective Nok Sariga Amulets issued in the same 2552 Wai Kroo Edition. 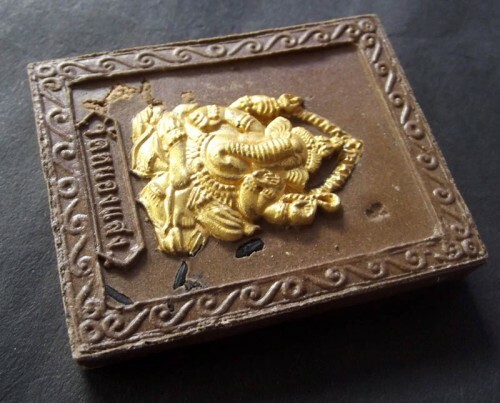 The rear face features Pra Pikanes (Ganesha). 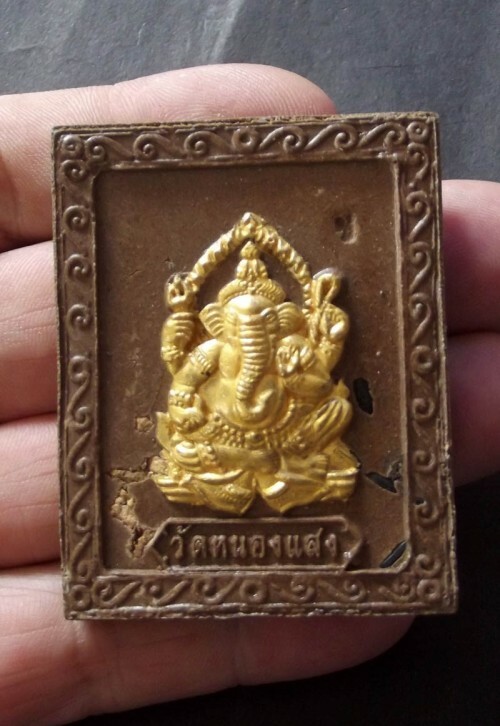 This amulet is Doubly Attractive because you get two different Devas in one Amulet which are both Powerful to Improve Business, Selling Quotas, increase Customers and Profits, Remove Obstacles and Initiate Success. The area surrounding the Devas is filled with Sanskrit Inscriptions of Vedic Spells. Some fragments of Sacred Muan Sarn are sprinkled into the rear face of the amulet. This Ongk Kroo Version has a much higher concentration of Rare and Valuable Sacred Powders than the Standard Version Amulets of the edition. 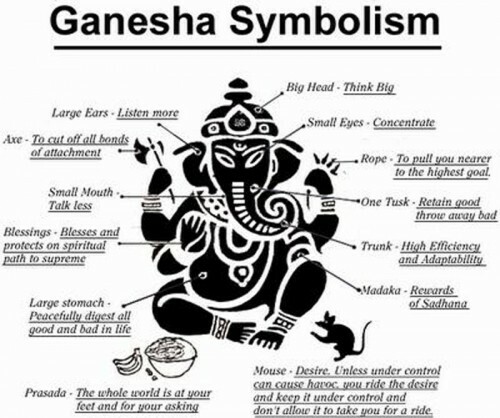 Ganesha or, as we say in Thai ‘Pra Pikanes’ is the Deity for removal of obstacles and attainment of success. Pra Pikanes has many different forms, with different meanings. he may have four, six, eight, twelve or even fourteen arms, but almost never two arms, this being a Tabu. Pra Pikanes may carry any of a number of 57 different Cosmic weapons or regalia in his hands. 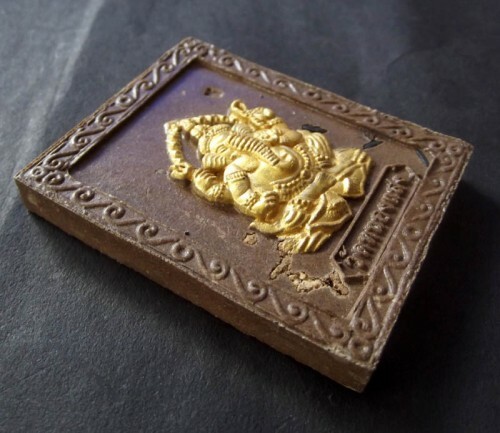 Note from Ajarn Spencer Littlewood; “A comprehensive knowledge about the meaning and the meritorious abilities of Ganesha (or other Deities for that Matter), will lead to the wearer of the amulet bearing such qualities of character in mind, and eventually to develop such Meritotious Qualities in oneself. – Some people revere Devas simply for gaining assistance or help, and blessings, but others revere the Devas, for they admire the qualities they see within those Devas, of strength and perfection and raised high above worldly sufferings. To know that the mouse represents the mastery over ones instincts and desires, is to remember to try to not let desire take yourself for a ride.. study the qualities of your Devas, and contemplate how to develop those strengths yourself, this is a higher blessing than any wealth or worldly treasure – this kind of Devotee who imitates his positive heavenly Idols, will work towards becoming like those Devas which he idolizes and reveres, which is the true purpose of Deity Worship in the Long Run, and even Moksha can be achieved as a Goal through Devotion to Gurus or Deities, which is an act of Self Renunciation, and can lead to Liberation.